Today at our TechCrunch Disrupt conference in New York, Uber CEO Travis Kalanick and Airbnb CEO Brian Chesky took the stage with our own Erick Schonfeld to talk about the disruption they’re offering up in their markets. Notably, both have products that are so disruptive that they have legal challenges from not just other companies, but governments (on the city and state level). 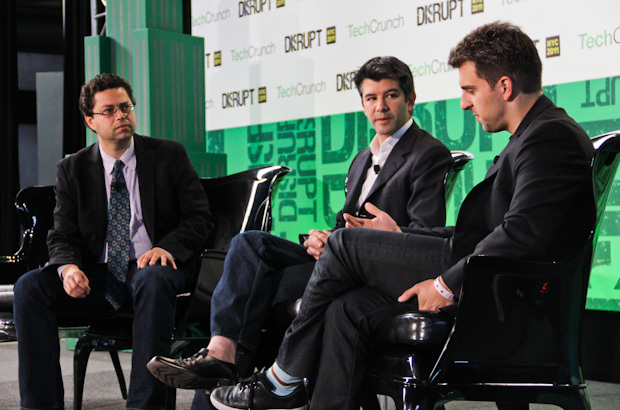 “I think I’ve got 20,000 years of jail time in front of me,” Kalanick half-joked when Schonfeld asked him about Uber’s highly publicized legal challenges (which actually made them change their name from UberCab). Kalanick came to that number because the city of San Francisco is threatening Uber with 90 days of jail time for every ride they offer. Oh, and there’s a several thousand dollar fine for each ride as well. Obviously, Uber is fighting that threat. The state of California has also since threatened Uber. Meanwhile, Chesky noted that New York City also raised issue with the basic Airbnb model. The issue really is that you’re not supposed to rent out your own space for more than 30 days (if you’re not a hotel, obviously). After a 500-person rally in support at NYC city hall, the city looked into the issue and realized that what Airbnb was doing was actually pretty interesting. Chesky says that Airbnb just has to make sure people are renting out their primary residences and not working some loopholes to create de-facto hotels.